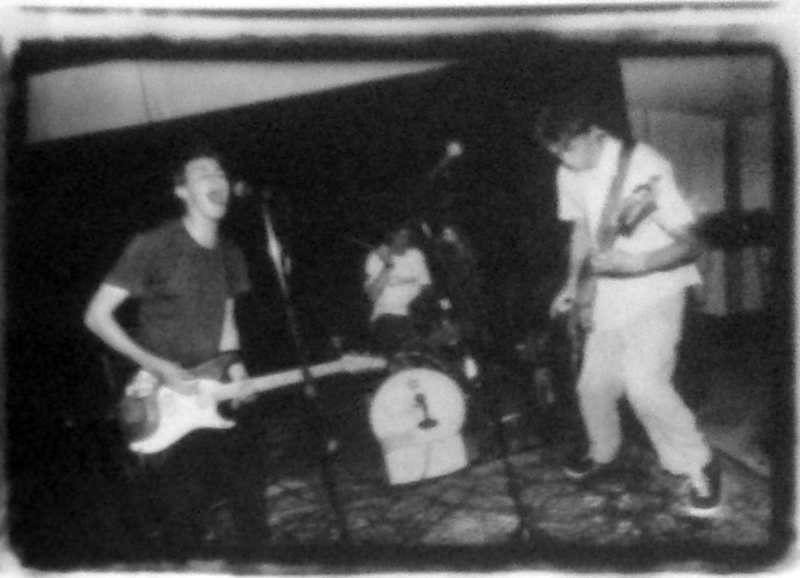 Before Kenobi started, Andrew Tweedy, Peter Read, Stephen Martin and Gunars Kazaks were in several teenager bands that made up the early years of the 90’s. 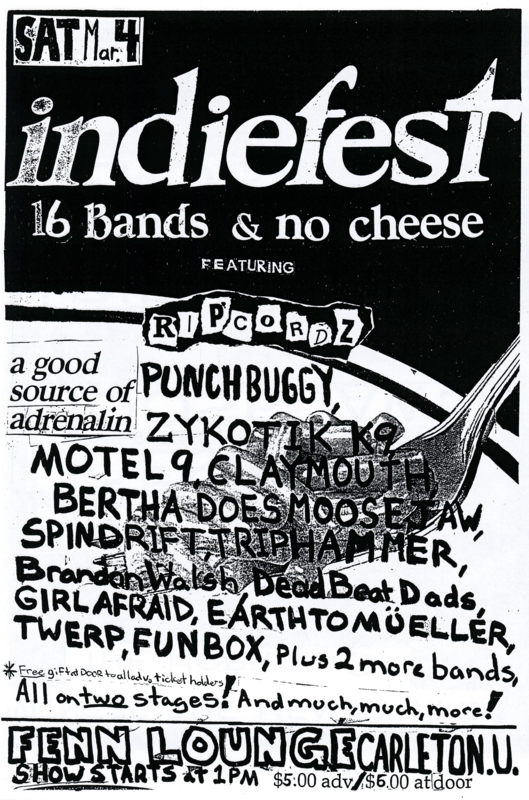 Those included “Twerp”, “Mush” and “Joyjuice”, grunge influenced bands which featured cover songs like Nirvana’s “Breed”, Metallica’s “Enter Sandman” and Guns ‘N Roses’ “Knockin’ on Heaven’s Door”. 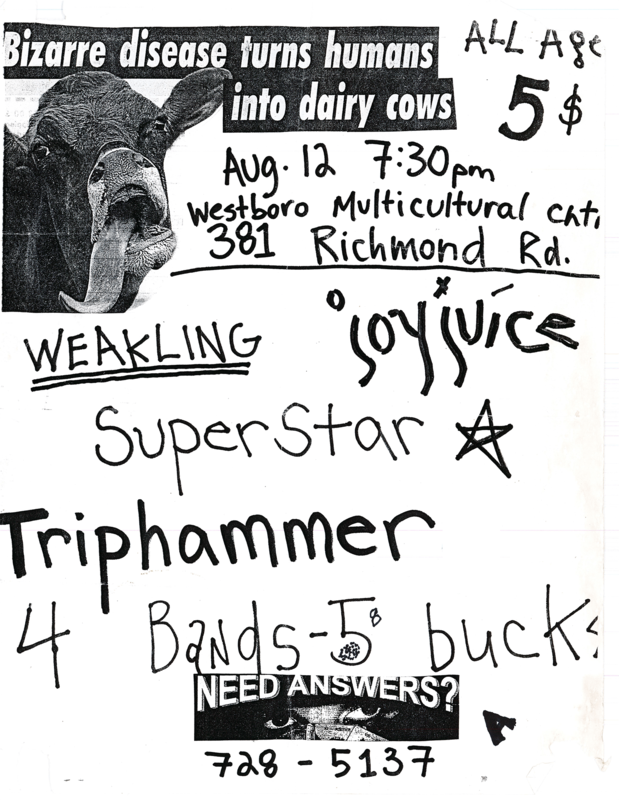 Joyjuice lasted roughly two and a half years, yielded a demo and played nearly twenty shows. 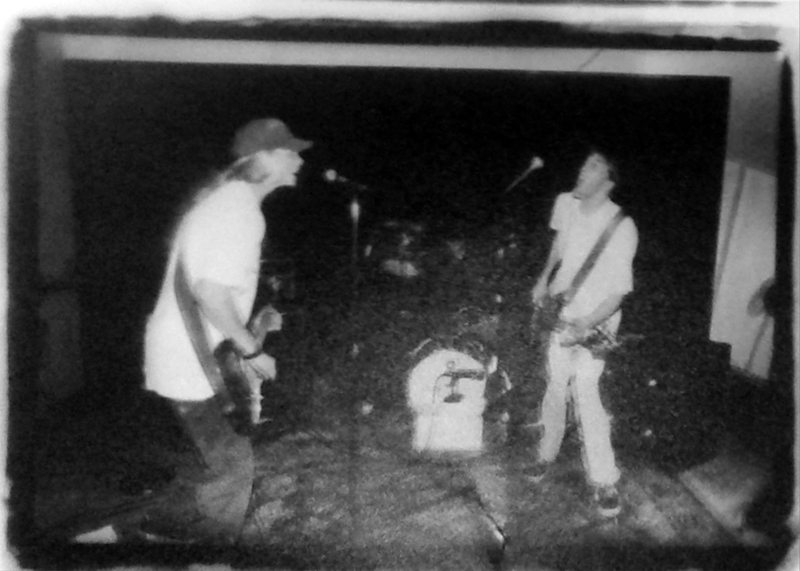 But it was in the summer of 1994 that Gunars was let go with Andrew and Peter switching off between frontman and drummer duties between songs. 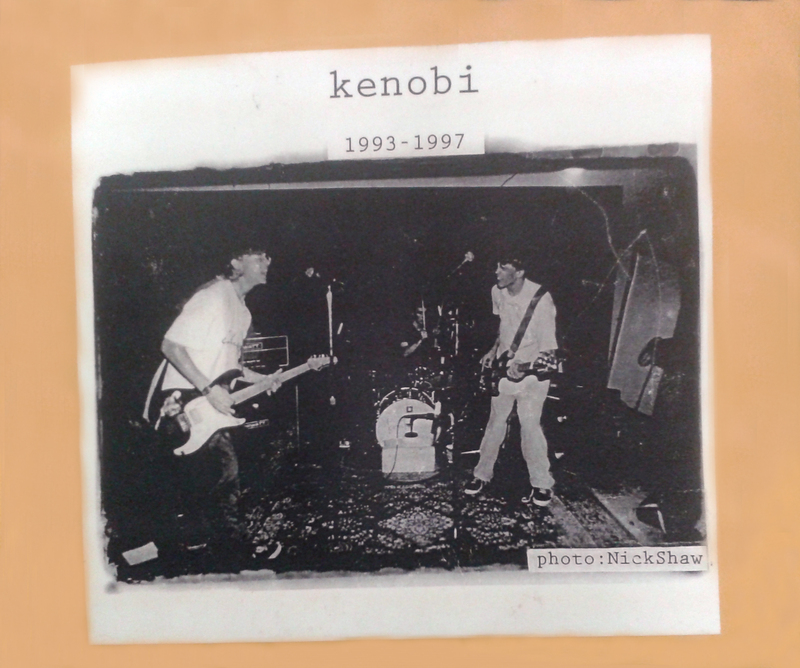 Kenobi was then Andrew Tweedy on vocals, guitar and drums, Peter Read on vocals, guitar and drums and Stephen Martin on vocals and bass. 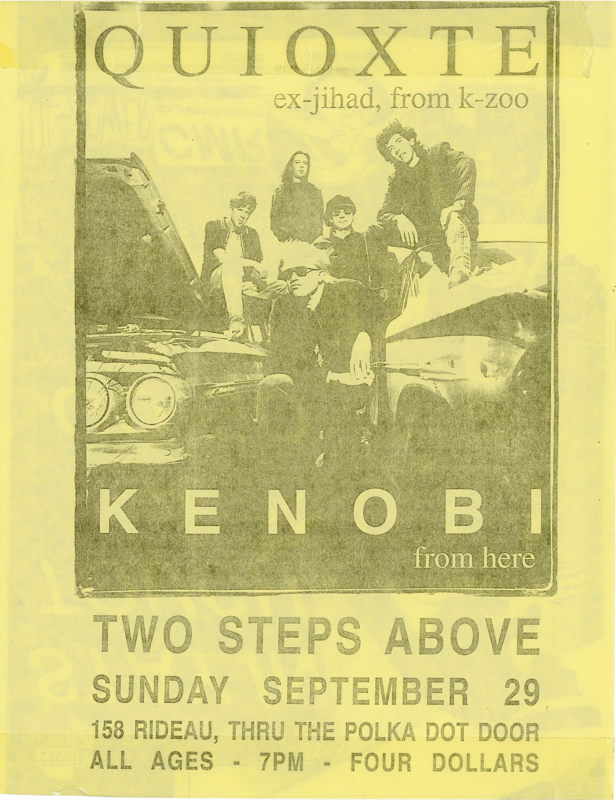 The Star Wars influenced name was chosen by lack of agreement on a better one, which Pete lobbied hard for because he wanted a band name that started with a “K”. 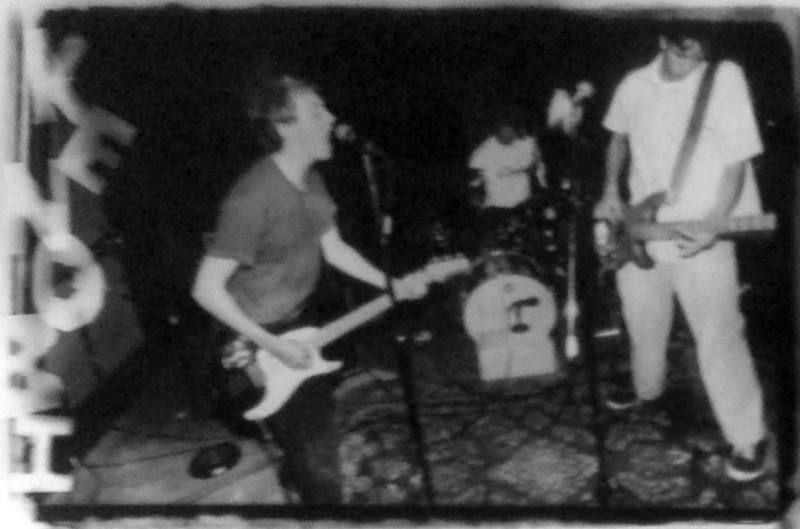 The real influences for the band came from Sebadoh, Union of Uranus, Shotmaker, Okara and weekly orders to Ebullition Records. 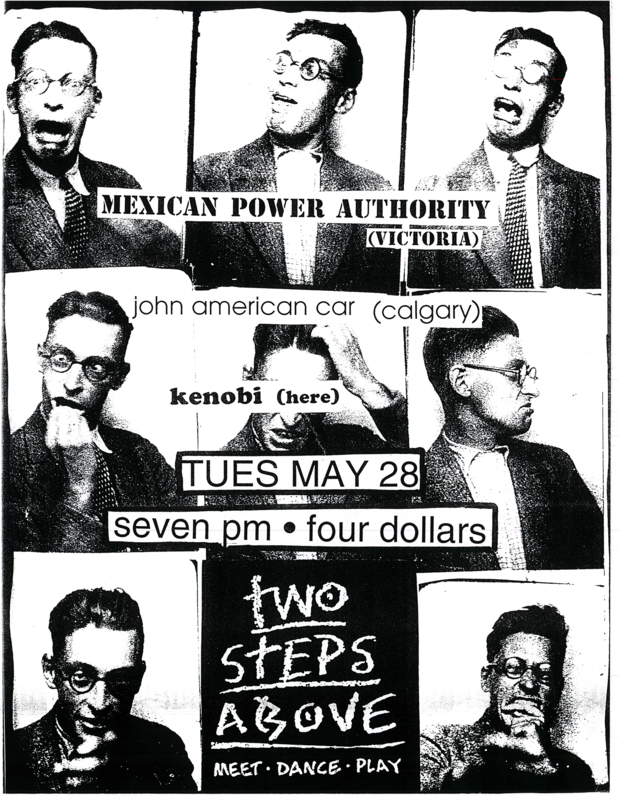 Kenobi may have played some coffee house shows as warmers but their first real show was at Two Steps Above with Mexican Power Authority. 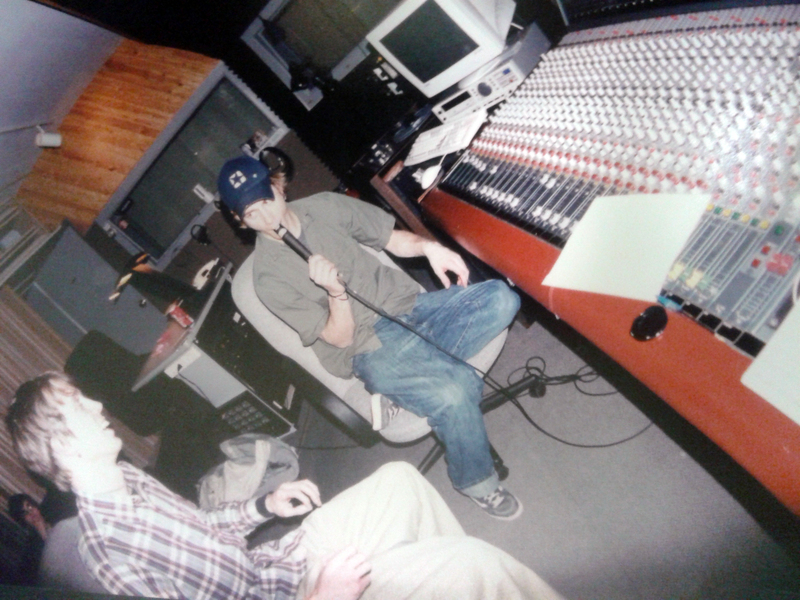 MPA were on an Ontario tour in support for Ragamuffin Soldier Records’ release of “Haikü…Gesundheit” in 1994. This was a huge deal for the band as they were playing with a real touring band. By this time the band had stopped playing covers and only played their originals. 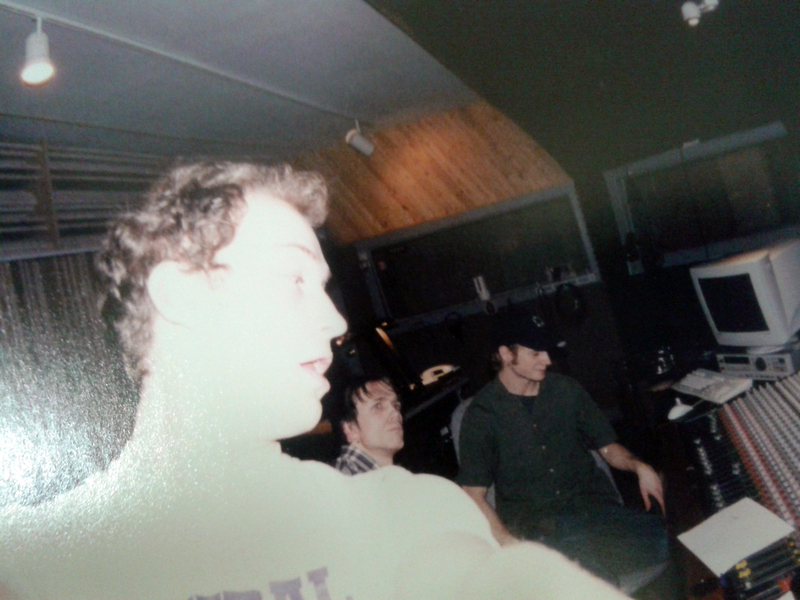 In 1996 the band recorded their first and only demo in Pete’s basement. It was tracked on a two-channel mixer, straight to cassette with all instruments into one and the vocals in the other and then all panned center. 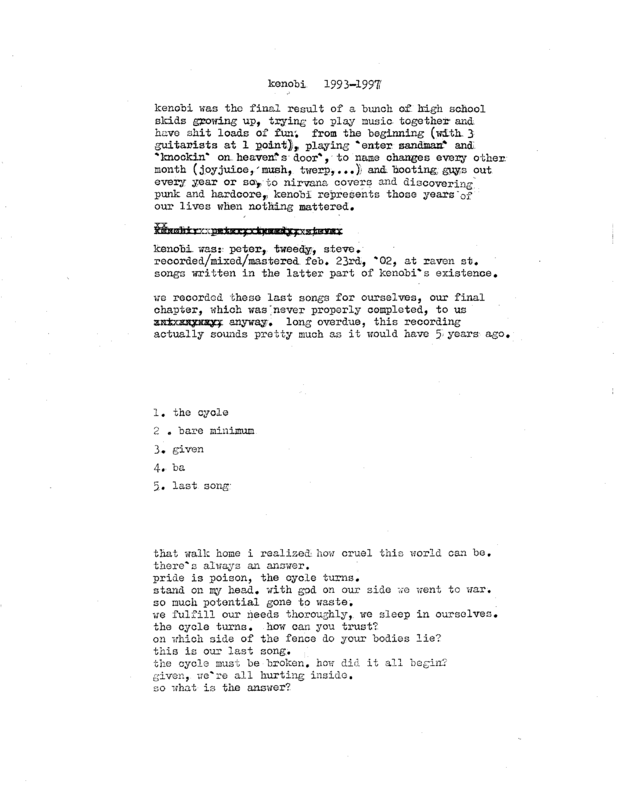 Over time the demo was dubbed on about 100 copies. By this time they were playing weekly around Ottawa and gained the attention of photographers Nick Shaw, who would go on to play in Buried Inside, and Shawn Scallen, who started putting up shows as well. 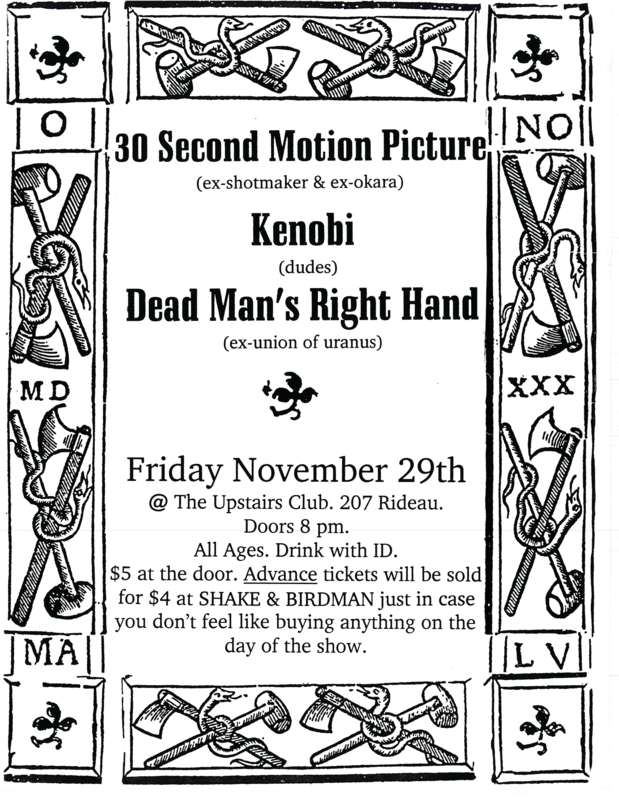 On November 29th 1996 Sean booked Kenobi to play one of their most memorable show with 30 Second Motion Picture (ex-Shotmaker, ex-Okara) and Dead Man’s Right Hand (ex-Union of Uranus). 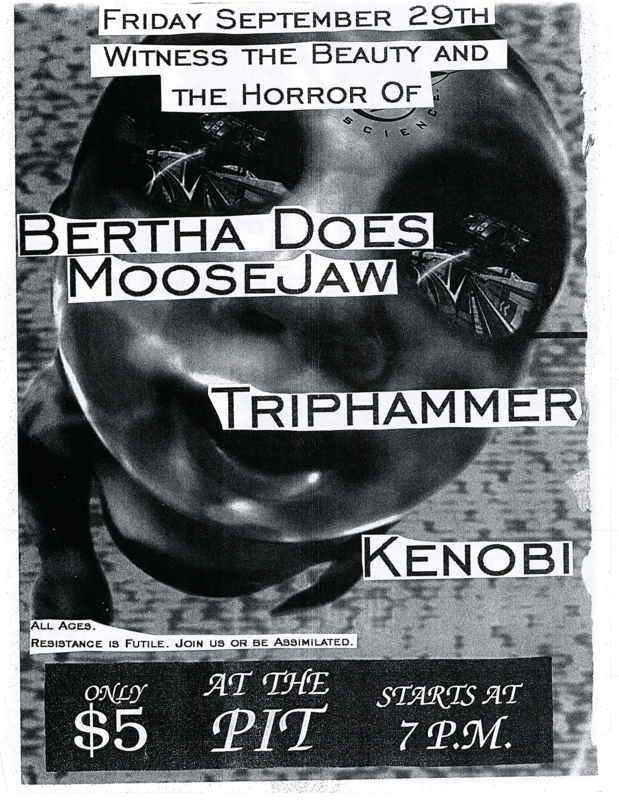 The flyer for this show would later be used on their 2002 CD. The three members were very close friends and hung out all the time. But as people often do at such a young age, over the course of the next year or so, they slowly drifted in different directions. Steve and Andrew knew that Pete was getting ready to go away to college and decided to start something else. And so Kenobi ended around spring of 1997 and Buried Inside began. It was in February of 2002, five years after the breakup that things for Kenobi happened again. 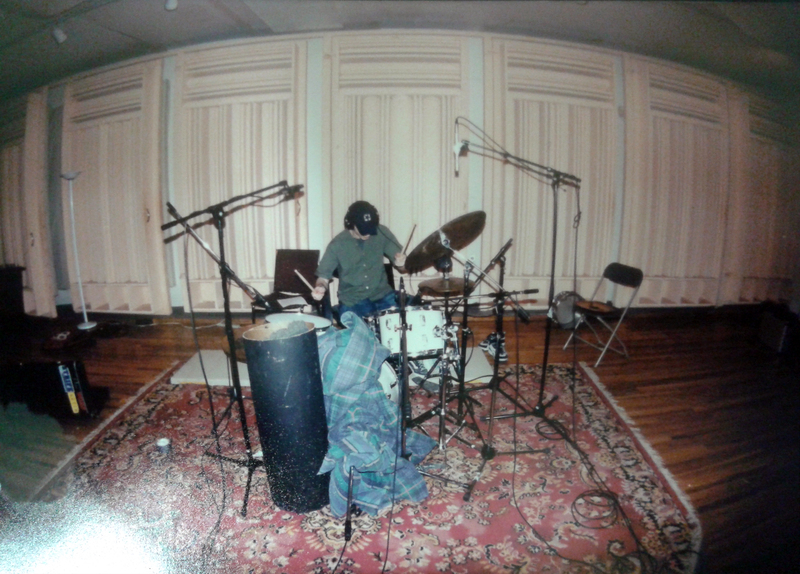 Andrew was working at Raven Street Studios in Ottawa and one day (February 23rd) after work, Pete and Steve came in to track six songs, without ever practicing beforehand. They simply jammed out until the songs came back naturally and recorded that same night. 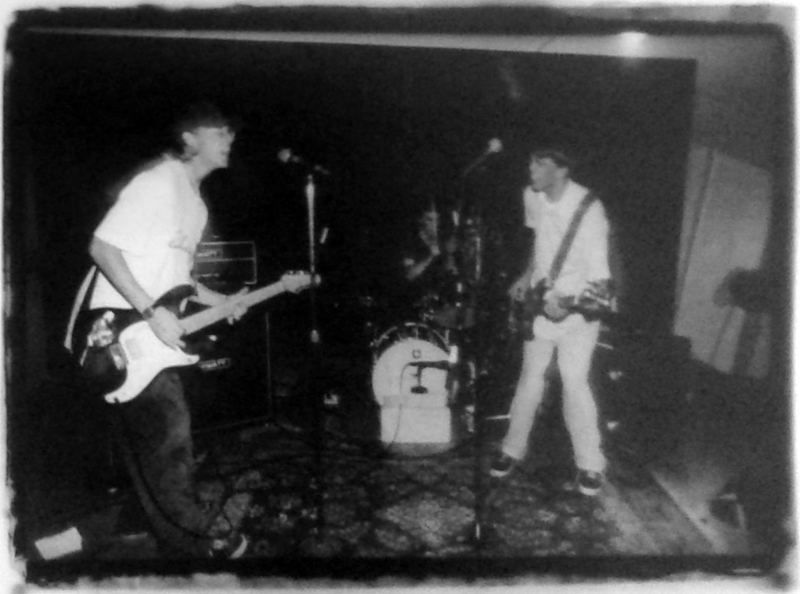 Five originals were recorded, one of which was re-recorded from the demo, plus a Nirvana cover for “Breed”. This served as a way to document songs that were never recorded before and to give a proper farewell to the band. The band never had any reunion shows nor were the songs ever incorporated into Buried Inside sets. 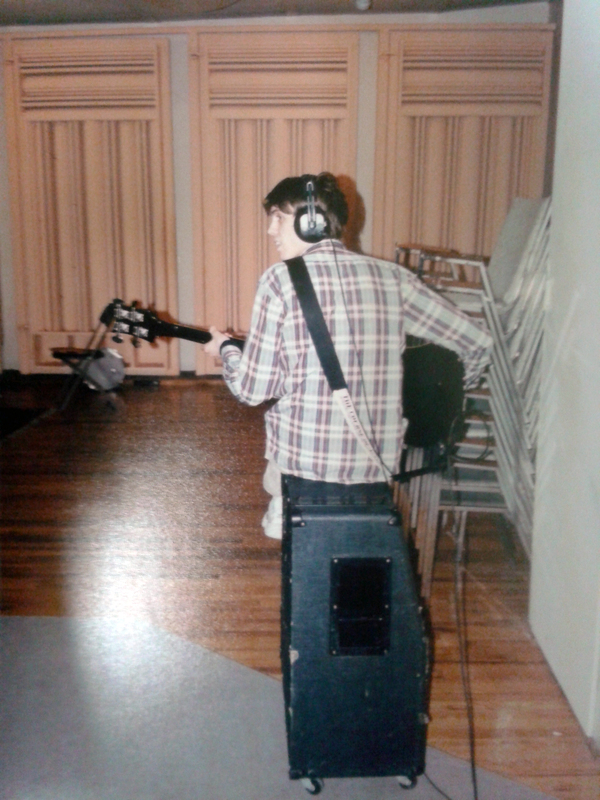 The CD was professionally pressed on 100 discs and hand packaged, using one of Nick Shaw’s photograph on a manila envelope and the previously mentioned November 29th 1996 show flyer for the insert. 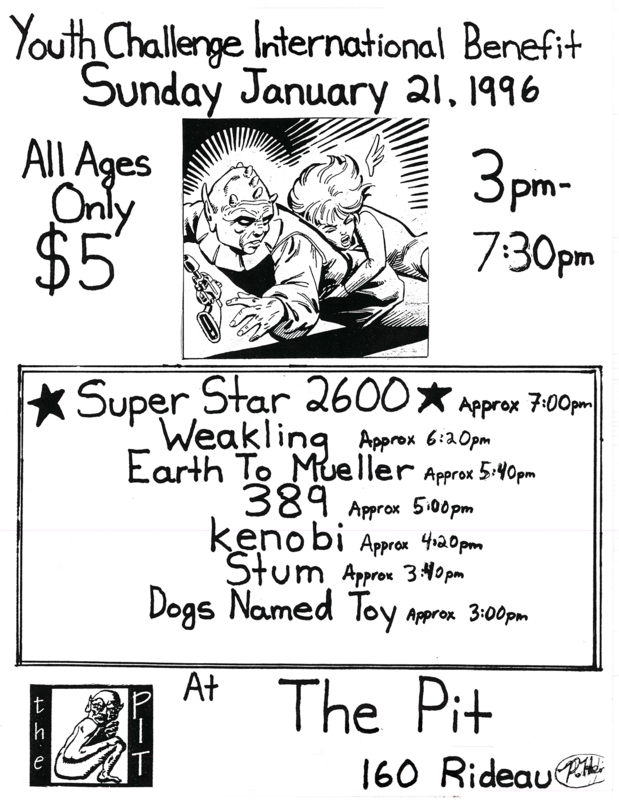 It was then sold (almost exclusively) at the Buried Inside show on October 31st 2002 for a dollar each. Obviously all this was done with the right intentions.